This is a quick garment makeover, but what an improvement! I’ve just done one side so far so you can see the difference. I bought this top a few years ago… it was on sale and all my favourite colours. But it was too big so I took it in. 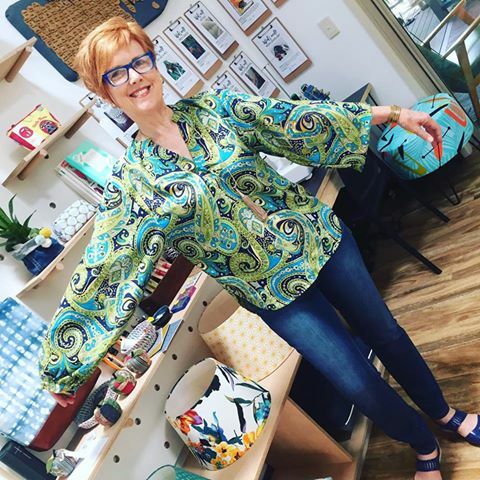 I’ve worn it a few times, but, in reality, it was still too big and there was way too much material in the sleeves, which were too long and I felt like they dwarfed the proportions of the rest of the top. After I wore it to the movies last night I thought, right, tomorrow I am making you fit properly. Here is my process: 1. I neatly cut off the cuff including another 8cms of fabric. 2. I pinned in the side seams until I was happy with the fit and then stitched the new side seams and overlocked. 3. I folded up another 4cms of the sleeve for the hem after overlooking the raw edge. 4. I stitched the sleeve hem. Done!!! I am really happy with this now and can see myself wearing it much more frequently.